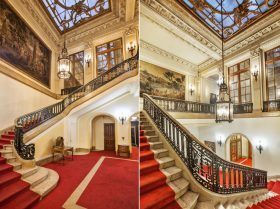 A few weeks ago the New York Post reported that the six-story Beaux Arts mansion at 854 Fifth Avenue that had belonged to the granddaughter of railroad baron Cornelius Vanderbilt and which most recently housed Serbia’s Permanent Mission to the United Nations was about to hit the market for $50 million. Built in 1905 for stockbroker and future governor of Rhode Island R. Livingston Beeckman and designed by the same firm that designed Grand Central Station, the building is virtually unchanged, including hand-carved balustrades of white marble, ceiling frescoes of angels and clouds and an original working stove. The opulent abode includes two elevators, eight bathrooms and 32 rooms in total. Now officially listed for sale, the storied Upper East Side manse reportedly already has six potential buyers.